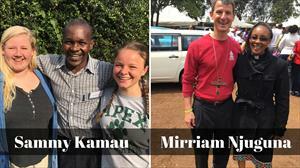 We are happy to announce that our Kenya Partners from Sigona Presbyterian Church will be visiting Davidson October 25 – November 7. Rev. Mirriam Njuguna and Sammy Kamau will be the delegates this year. We are hosting a dinner for them on Monday, October 29th in the Congregation House from 6:30 – 8:00 pm as a way to allow members of the congregation to meet them and hear from them in a more intimate setting. Please plan to join us and encourage others to do so. Thank you. Please specify if you have food allergies, are vegetarian or need a gluten-free meal.